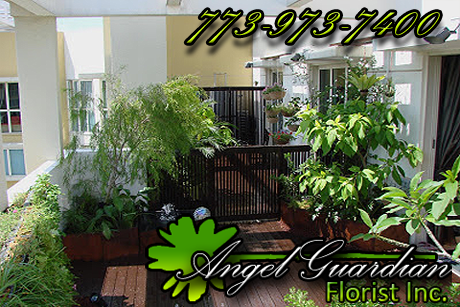 Angel Guardian Florist, Inc. offers over a century of creative experience and true artisan talent to individuals and corporations in the greater Chicagoland area when it comes to Urban Landscaping. Our exquisite container gardens, window boxes, perennial beds, and organic landscapes are custom-designed to complement your personal taste as well as your site's architectural style. With a large selection fresh and exotic plant combinations and fashionable containers, we will design and install your urban landscape to your complete satisfaction. and holiday decor services throughout the year. Requesting your free consultation is fast and easy! Simply call us at (773) 973-7400 to speak with a representative now. Or submit our Floral Service Request Form below to have a representative contact you within the next business day.